As Animal Collective ventured into joyful accessibility with Merriweather Post Pavilion in 2009, there were hints and doses that called back to Noah Benjamin Lennox's most recent solo project as Panda Bear, a little album called Person Pitch. Both albums found ways to incorporate the electronic and the choral. Reaching for strange and exciting beats while cementing them with Beach Boys style soothing vocals. A song like "My Girls" from Merriweather is typical of this venture, where pop and harmony is embraced as much as experimentation and overt weirdness. And so that design continues to be Lennox's mission on this newest of Panda Bear releases. Tomboy is as smooth, honey-like and calming as anything Animal Collective and/or Panda Bear has put out thus far. It has the complex and distinct tones of growth and confusion, riding minor chords and wailing drones to emphasize the emotional resonance that lives with a batch of poetic lyrics. And for every moment that feels like a religious experience, the kind of feeling one would imagine sonically imbued at the crossing of a cathedral threshold, there is another moment of crunchy electropop/rock that fuses the group together and makes the album nearly as dance-able as it is peaceful. The aptly titled "Drone" is a great example of the former, a song that feels thick and long and heavy. It commands emotion and interest and is that type of track that would, with the proper sound system, force the listener to feel it with his entire body, ribs rumbling, skin tingling, ears echoing. And yet it is followed by "Alsatian Darn" and a driving guitar, a complex desirous beat and bounding vocals that seem to elegantly break free of the track when they can. Even among the buzzing and clatter, this is a song that could well find a home on a folk station, if only the production were dropped back the slightest bit. The title track "Tomboy" also falls into a realm of ideal catchiness, sweetly repetitive and rolling with a progression that is as hooky as it is original. This is a snowball track, picking up little, subtle additions as it goes, getting bigger with time, and then rumbling off into a bridge of droning sound walls. But "Last Night At The Jetty" is perhaps the most lovingly revivalist of Pet Sounds era Beach Boys. It's a kind, straightforward track that embraces cleaner vocals and still holds onto a bit of a canticle-style jangle, dancing along the line of electronics and purity. Regardless it remains imminently recognizable and lovable. But perhaps the top honors on Tomboy go to a pair of tracks: "Slow Motion" and "Afterburner." On "Slow Motion" there is a vibrant, desirous crunch that drives a song that thrives on buried melodic beauty. And "Afterburner" features a rumbling bass riff that stomps along the back wall of the song, far behind the echos and scratchy additions, holding up a track of spacey sound and pleasant choral singing. And drives the object as if it were an animal running wildly through a murky forest. And "Surfer's Hymn," in opening with a sample of waves crashing and vibraphone-like tones, weeps naturally despite it's heavy production. 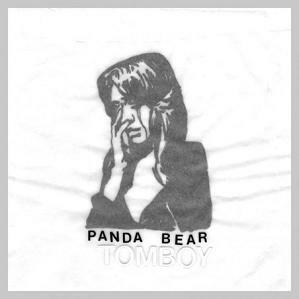 There are ways that this is a natural Panda Bear album, but they are subtle enough that Tomboy feels neither like an abandonment of the standing ethos, nor a total marriage to it. For an album with such great expectations, and such a potential to disappoint, in being too similar to Animal Collective, or too great a departure, Panda Bear's newest thrills by toeing the necessary line and by suffusing an aural experience with equal parts organic and man-made. In that way, it lives up to its name, as a tomboy is so often a cutesy moment of youthful gender line-blurring, this album blurs the lines of electronic and natural to become more well-rounded and ultimately stronger.